Passionate about science? FameLab are searching for the most exciting new voices in science. Passionate about science? You have 3 minutes, no Powerpoint and no jargon… do you have what it takes? FameLab applications are now open. International FameLab, the world’s leading science communication competition, aims to find, develop and mentor young science, mathematics and engineering communicators, building a celebrated network of researchers, who are able to get everyone – from school kids and adults to government officials and business figures – talking science. Many Australians live in coastal areas and occupy catchments which supply waterways that empty into the ocean. So there is a direct link between healthy waterways and healthy marine environments, and for much of Queensland that includes coral reef environments. ReefED: online resources and activities from GBRMPA. Australian Marine Environment Protection Association: AUSMEPA provides FREE educational resources on this website to help teachers plan and undertake a unit of work about key marine environmental issues, including climate change and storm water pollution. Reef Check Australia: The Reef IQ Educational Program includes courses and workshops that allow students to undertake simulated coral reef surveys in the classroom. Marine Education Society of Australasia. Ocean Life Education ‘Brings the Sea to You’ with fun marine education programs including live marine animals designed to inspire students of all ages to appreciate and take responsibility for the marine ecosystem. The Global Learning Centre is a not-for-profit community organisation dedicated to supporting education for justice, peace and sustainability. Healthy Waterways: An NGO that provides information and resources on water education in South East Queensland including: information, resources and games. The Up a Dry Gully Schools Program challenges primary and secondary students to explore and understand how water must be safe, secure and sustainable for our future. CSIRO: CarbonKids is an educational program that combines the latest in climate science with education in sustainability. CSIRO Education, North Queensland: Eco-enigma – An environmental case study where the class becomes a scientific team preparing an environmental impact report. By measuring heavy metal levels in fish, analysing silt in a river etc, students find out who is responsible for the environmental health problems of Sunny Valley. Department of Sustainability, Environment, Water, Population and Communities: Australian water education resources. Sea World (Gold Coast): Excursions and education programs. Reef HQ Aquarium (Townsville): Age-specific, innovative curriculum-centred programs include interactive activities and investigation challenges, stimulating inquiring minds to discover all they can about the Reef. Brisbane City Council Environment Centres: Downfall Creek Bushland Centre and Boondall Wetlands Environment. Education Queensland Environmental Education Centres. Exhibitions and school programs at the Queensland Museum & Sciencentre and Museum of Tropical Queensland. Brisbane City Council, includes Brisbane City Council’s environmental and cultural learning programs and Green Schools. Gold Coast City Council: School Watersaver Education Program which encourages students to work towards a sustainable water future. The museum has a rich repository of authoritative information and resources, including online content, interactive learning objects, games and school loan kits. Biodiscovery and the Great Barrier Reef: Biodiscovery is the quest for bioactive chemicals from living organisms. Investigate some of the factors affecting the survival of reef organisms and how human activities and climate change are having an impact on the reef. Backyard Explorer: An invertebrate biodiversity audit resource kit that can support biohealth assessment component of a sustainability program. The museum provides loan kits that support object-based learning. 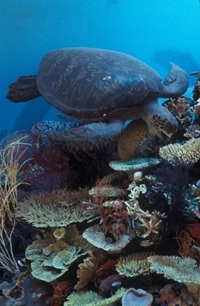 For example: Marine Life: Explore a variety of marine life and how they interact with their environment and each other. Investigate interactions between living things and suitability for a marine habitat.